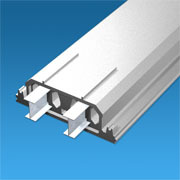 Polystyrol rigid foam ceiling elements are made to measure and equipped with sheet steel. Ribbed ceiling slab according to DIN 1045: load-bearing capacity is achieved by an individual reinforcement of the ribs and the board. The underside of the ceiling surface can be rendered or smoothed over. Easiest possible assembly of ceiling lining systems and wooden ceilings by inserting battens on site. It takes just 1 minute to put up one square meter (two people), thus making it faster ever ceiling to put up. After the rib reinforcement as well as any necessary electric wires have been laid, you can apply the concrete by pump or silo. The concrete thickness should be 6 cm or more, according to static necessity. From a static point of view, ARGISOL Eurorip ceiling elements are permanent shutterings of ribbed ceilings according to DIN 1045.